Due to its simplicity in construction, ejector is widely being used in applications such as extraction, compression, ventilation and air conditioning, uniform mixing of two streams and propulsion or lifting. Although being a small component, jet ejectors play a crucial role in industrial steam jet refrigeration systems. Its purpose is to increase the motive steam pressure through convergent-divergent geometry, and also allow the entrainment of secondary steam to promote regeneration. The efficiency of the refrigeration system is fairly dependent on the ejector performance, despite having no movable parts. As such, ejectors are required to be designed according to the required refrigeration application. Its efficiency however relies on several geometrical factors, such as nozzle diameter and angle, throat and diffuser length. 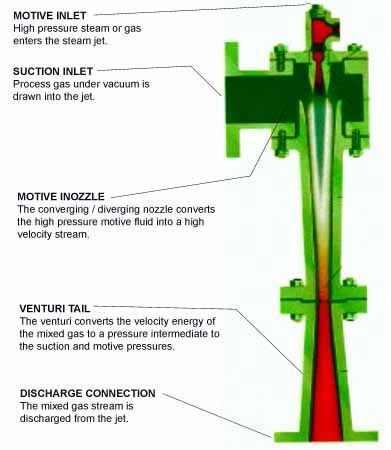 The geometrical variables in the ejector have a significant impact on the suction and discharge pressure. As such, various empirical relations have been developed to figure out optimum design. While it is evident that the performance of the ejector requires altering the geometrical parameters, it is also a “one-point design”, which means that once the unit has been designed and built for definite specifications of motive, discharge and suction pressure, it suction capacity cannot be altered without changing the geometrical parameters. Thus, physically examining the performance in order to achieve desired performance is quite time-consuming and costly. In order to achieve accuracy in design optimization, it is required to have detailed insights on the fluid flow patterns inside the ejector geometry. Using computational fluid dynamics, the interaction between motive and secondary fluids can be predicted, along with insights on reverse and choked flows that affect the outlet pressure. Since, there is enough information made available thorough simulation techniques, the flow characteristics can then be studied to alter the geometrical parameters of the ejector. Additionally, through CFD, the effect of inlet pressure and temperature conditions can also be studied thoroughly. The pressure drop analysis in CFD will provide details on where exactly the flow is reversing or is choked according the inlet operating pressure and temperature conditions. This study allows deciding the throat diameter and length, in order to ensure that the required outlet pressure condition is made possible. The CFD investigation methodologies allow implementing design changes virtually, and study its effect, without actually developing the prototype and invest time in experimental tests. However, this doesn’t entirely eliminate physical examination; the CFD results are not accurate and require physical validation. This is mainly due to the fact that the computational model works on the solver capabilities, which itself is developed using mathematical equations and assumptions. Ideally, CFD results can be utilized to shorten the design cycle as well as cost involved. Since ejectors are “one-point design”, as mentioned above, assistance from CFD results will provide better insights to engineers seeking efficiency enhancement of the ejector for specific application.